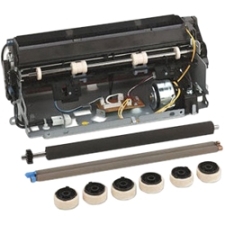 The fuser maintenance kit includes transfer roller, charge roller, pick tires and fuser. Kit installation is recommended every 300,000 pages. The operator panel displays the message 80 Scheduled Maintenance at each 300K page count interval. It is necessary to replace the fuser assembly, transfer roller, charge roll, and pick tires at this interval to maintain the print quality and reliability.